Naval officers assigned to learn Japanese at Oklahoma A&M University. Photo courtesy the Sheerar Museum of Stillwater/This Land. During World War II in Stillwater, Okla., home of Oklahoma A&M College, city and school officials had sought various military programs to benefit the local economy. 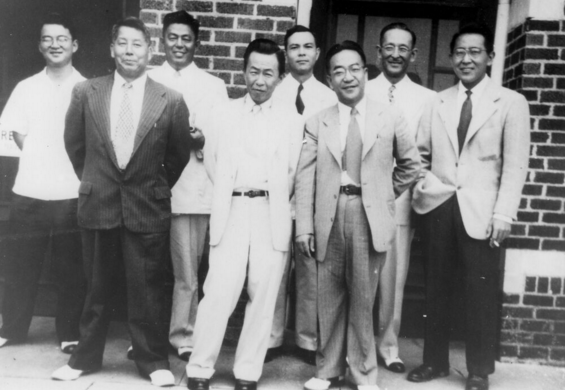 After several missed opportunities, in April 1945, they were chosen to develop a new site for the U.S. Navy’s Japanese Language School, where ensigns would learn Japanese — the goal being to prepare for an invasion and occupation of Japan. While the Stillwater campus was late to the mission compared to other sites (such as Boulder, Colo.), the intense one-year time frame allotted to achieve fluency was expected to produce the necessary translators, interrogators, clerks and data specialists for the mission ahead. At the time, Asian studies was in little demand, and only a handful of American schools provided courses. 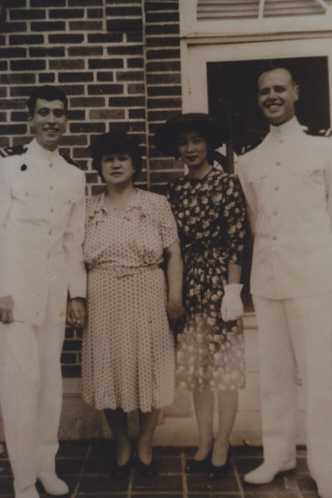 Therefore, the Navy relied on sensei, or Japanese teachers, to serve as faculty and mentors. One can only imagine the culture shock for the approximately 500 Navy personnel arriving in the conservative prairie town of Stillwater. Many of those chosen were broadly educated, well traveled and sophisticated code-breakers with off-the-charts verbal gifts. To make matters more difficult, Oklahoma was experiencing a record-setting heat wave, and the sailors’ demands to wear “short pants” was offensive to the locals. Alcoholic beverages were nowhere to be found. Members of the Japanese contingent in front of an OSU educational building. Photo courtesy the Sheerar Museum of Stillwater/This Land. But their experience couldn’t have been as dramatic as those of the Japanese individuals and families who were recruited for duty. In some cases, they already had been interned in California by the U.S. government and were asked to relocate, traveling by train cross country. While Stillwater was a friendly college town, anti-Japanese sentiments ran high. Meetings were held to express concerns over the new “residents.” Where to educate Japanese children was a controversial topic, as the segregated town school was, by law, authorized only to teach African-Americans, making public school the only option. Performers at the Spring Festival at Oklahoma A&M’s Old Gym on March 2, 1946. The event was aimed at sharing Japanese culture with students and citizens of Stillwater. Photo courtesy of the Sheerar Museum of Stillwater/This Land. Nevertheless, the ensigns fully engaged in their studies, and soon the sensei integrated themselves successfully into the community, to the extent that Japanese students became leaders of Stillwater High School. When the war ended abruptly, it became clear that these individuals would no longer be needed for the war effort. 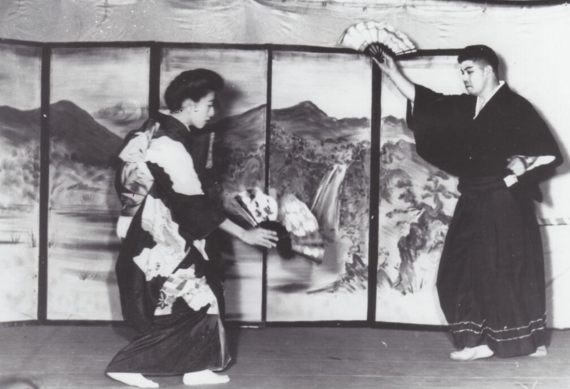 The Stillwater language school closed in June 1946, following a spring farewell cultural event planned by the sensei and attended by community members. Students drifted into business and academe, filling the gap in Asian studies to such an extent that today the “family trees” of many scholars around the country are rooted in places like Stillwater and Boulder. The sensei also scattered, some back to their homes and others finding new careers in the U.S. This story is told partly through the recollections of Ensign R.E. Graalman of Okeene, Okla., 70 miles west of Stillwater, who had been pleasantly surprised after previous war postings to come home for this mission. The local Stillwater museum, the Sheerar Center, offered an outstanding exhibition in 1991, showcasing pictures and memorabilia of that time. Mr. Graalman spoke briefly at the event’s opening, primarily to compliment the abilities and bravery of his teachers, observing they had been torn from their family homes, not once but twice during the war, and yet continued to perform a service for their country, which had treated them poorly. This article originally appeared in This Land as a longer piece and is summarized here with the author’s and publisher’s permission. To read the original article, visit thislandpress.com/2015/03/11/ensigns-and-sensei. View all posts by R.E. Graalman, Jr.